WEST HARTFORD, CT- When the UConn Huskies and Hartford Hawks usually meet, it’s in the hallowed giant arena of Gampel Pavilion up in Storrs, but this year the Huskies took the trip down to Reich Pavilion and the cozy confines of the packed volleyball gym Tuesday night. Holly Strauss O’Brien’s club has had great success against Hartford in recent memory and the the Huskies lead the all time series 23-3 (source: Hartford Athletics). New Hartford Coach Alex Temkin has been at the helm for only a few games and was seeking his first home win, the Hawks fought very hard to give it to him, though in the end the Huskies prevailed in four sets. Set 1 was a dogfight, no pun intended, between the two sides as neither team had more than a 3 point lead the entire time. UConn got out ahead early, but Hartford gave chase eventually catching the Huskies to make the score 16-16 and taking a brief lead. At the 21-20 mark, UConn took a time out and jumped out to a 23-21 lead of their own with three straight points. Hartford attempted to correct but the Huskies held them off for the 25-23 win. Offense for the Huskies included Devon Maugle’s kill to open up the game, Erika Thomas launched herself into the air and hammered a spike down a few points later, Mattison Quayle lofted an attack over the blockers, Madeline Kuppe had two straight kills at one point, Maugle came up with a key save to keep the ball in play and then ended the volley back and forth with a kill, Marissa Prinzbach, the principal setter for UConn, faked a set and just attacked over for another point, Thomas and Quayle shared a block, Maugle knocked another attack off the blockers, Kuppe launched a shot to a gap in the defense, Maugle struck again twice soon afterward, and Thomas and Quayle stuffed a Hartford attack following that. Quayle would put the Huskies up by two late, and Thomas would add another block before Quayle ended the set with a spike. For Hartford, the Nethersole sisters were a major source of offense, as Sareeta had at least six kills placed all around the UConn defense, and Kami had a handful of her own including Hartford’s two last points of the set. 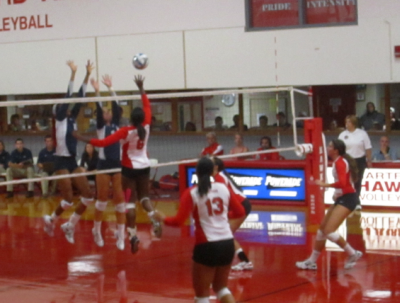 Dionna Kirton, Lindsey Compton, and Jackie Tamburri all had service aces during the set as well. Taylor McCreery got on the board with an absolute smash off the blockers and out of play, and another hard kill ended a UConn scoring run. Lindsay Anderson also blasted an attack to the corner, and both she and McCreery picked up other kills later on. Kirton had added a kill earlier in the set. Set 2 was also a close one for much of it as the two teams battled to a 16-16 tie before Connecticut started to pull away. Even so it wasn’t until late that Connecticut was able to turn a two point lead into a 6 point 25-19 set win but a scoring run did it. For UConn, Maugle struck again early with a pair of kills around one from Thomas. Prinzbach sent a serve over later that went unreturned. Quayle went airbone to hammer an attack over the net, and later Kuppe had two straight kills into gaps. A stray Hartford pass landed in the hands of Jackie Wattles who hacked it back at them hard. Prinzbach picked up a service ace later on, and Maugle came up with two titanic spikes in the same time period including one that went off the defense and into the bleachers. Quayle added a service ace of her own points later, Wattles found another overpass to attack, and had a kill off of a set as well. Maugle ended the set by hitting an errant Hawk pass back at them. For Hartford, Compton opened the set with a serve that UConn couldn’t return and she later sent a mid court hit sailing over the net that UConn did not manage to return. Sareeta used a light touch and her sister hammered one off the blockers and down to the floor not long after. Libero Saara Carissimi had a key dig amidst this to keep the ball in play. Tamburri set the ball over and in, Anderson had another wallop, Sareeta leapt skyward and smashed the ball in, and added a block moments later. She, Anderson, and McCreery contributed much of the offensive scoring for the rest of the set. Offensively, the Nethersoles scored early, Anderson had a block and a kill. The decisive Hartford run started with a UConn attack error, but then the defensive libero, Carissimi came up with a dig which sailed hard over the net and UConn was unable to return it for a rare kill delighting her teammates. She stepped back and served up two straight aces as well. Sareeta added a block, and a UConn attack out of bounds sealed the lead. Kirton picked up another kill. Tamburri jousted with a Husky at the net and succeeded in poking it back over. Sareeta and Kami had multiple kills to hold the lead, and Anderson was also scoring. It would be Sareeta who ended the set with her spike. For UConn, Wattles and Prinzbach shared a block to open the set, and Brianna Datti served up an ace to start things auspiciously. Maugle, Quayle, and Kuppe kept up their scoring and Wattles did as well. Late in the set Maugle had a service ace of her own and soon after Quayle hurricaned a jumping kill over. Immanuella Anagu was substituted into the game late and she whipped a kill in late off a set. Karson Ratliff also, a substitute got in on the action with a block. UConn did not let the set 3 setback keep them from exploding out of the gate for an 8 to 2 lead in set 4. Hartford would attempt to catch up but the Huskies did not give them the chance all the way to a 25 to 16 win to take the set and the game. Maugle got the scoring started, Thomas added a block, and after a Hartford point spiked the ball into a gap, more points would follow including Kelsey Maving’s service ace, and Quayle picked up a point when her attack kabonked in a strange direction and out of play. Anagu contributed a block, and Maugle, kept scoring adding at least three more kill. Thomas and Kuppe were also in on the scoring, and Prinzbach faked out the Hartford defense with a fake set attack. Late in the set Thomas added another, and Quayle struck three times including a massive kill very late. Anagu added more kills including the one to end the game. For Hartford, McCreery had a bunch of kills throughout the early part of the set, and Kami added some of her own. A Sareeta kill, and a Tamburri deceptive fake set attack also worked to keep the Hawks close. Kami would also have a few kills in the final moments of the set. For Hartford, Tamburri led the team with 47 assists, Carissimi had 15 digs, and Tamburri and Sareeta Nethersole had 13. Sareeta Nethersole and Dionna Kirton participated in two blocks each. McCreery had .545 hit percentage, Anderson a .500, and Sareeta Nethersole a .324. Sareeta Nethersole accounted for 16 points, Kami Nethersole 14, and Anderson 11.5.